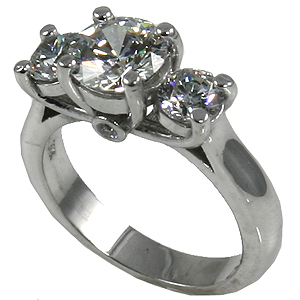 Stock #S1134: Very popular, contemporary, modified Lucern 3 stone ring. Nice, heavy, top quality ring. Beautiful Russian Cubic Zirconia. Also available blank to mount your stone. Available in 14k White and 14k Yellow Two Tone. 1.5 carat center stone with 1/2 carat sides. 2-.02 carat Accent Stones.